Recently I wrote a review about father and son Nelles and the newer wine called 1 Ahr: https://avdwineandfood.wordpress.com/2015/05/02/1-ahr-spatburgunder-nelles-2010/. You can find a lot about the vinery if you open the link or even visit their webpage at http://www.weinhaus-nelles.de/de/weingut.html. This is a heavy, rich and rather unGerman Pinot Noir as it is less smart and perhaps sophisticated than others. Spätburgunder from the valley Ahr are rather more fruity than for example the areas of Baden or Pfalz. This one is perhaps even richer than other wine from the Ahr area. There are varieties of fruits aromas as cherry, strawberry and blueberries. There are also flavors of dry herbal grass and some vanilla. I like the roast pepper note of is very, very much, which partly comes from the pretty present wooden elements of this wine. It is extraordinary oaky which could be perhaps a bit reduced and little less coarse. This said the wine is rich of tannin which harms very well with all other notes. The wine is round, velvety and with a pleasant vehemence although – please don’t misunderstand – it isn’t fat. It is rather a colder wine and – due its origin – also mineral. The Ahr is a very narrow valley. B-52 comes from steep slopes called Landskrone close to Heimerheim. The outcome of this vineyard is very limited due to is position. Obviously everything is done by hand and every grape precisely selected. The wine matured at least for twelve months in barrique, I guess even more. The color of this Spätburgunder is richer than usual although of course transparent as all Pinot Noir. 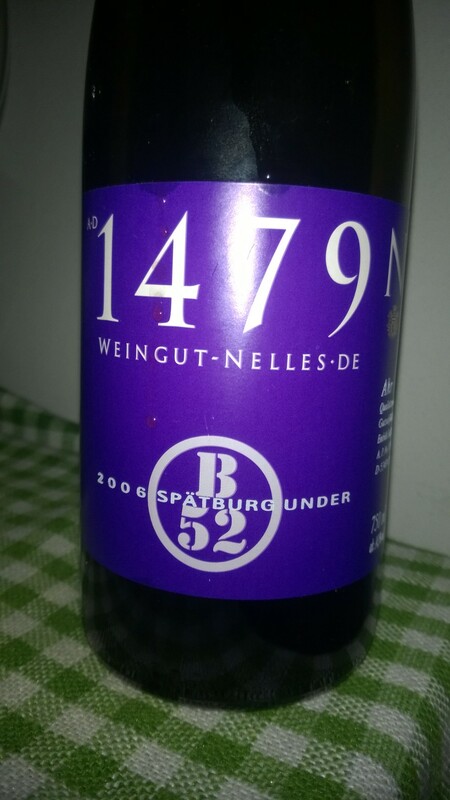 If you would compare this wine for instance with the Spätburgunder of Jürgen Leiner (https://avdwineandfood.wordpress.com/2015/04/03/spatburgunder-kalmit-weingut-jurgen-leiner-2009/) it is a complete different wine as both produce wine based on their own concepts. This is of course legitimate and brings us these wonderful varieties of wines. This is a special wine for special occasions. It is a great company for a menu dominated by meet. Sauerbraten, steak of deer or beef or any other beef roasts would fit perfectly. It could be also a wine which you would open with a good friend sitting on an open fire place. Give the wine time to breath! Be careful! The wine is unreasonably heavy in regard to alcohol (14,5%). This wine is old enough now to begin drinking it in my point of view.